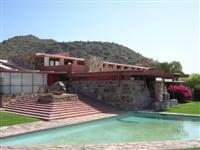 Taliesin West was legendary architect Frank Lloyd Wright's winter home and school from 1937 until he died in 1959, aged 91. Today the facility can be visited as the Frank Lloyd Wright Foundation with tours providing a general introduction to Wright and his hugely influential theories of architecture. The building has been constructed with the natural stone of the region, a reflection of Wright's philosophy that local materials should be used in design wherever possible. There are a range of tours available to suit your level of interest: for the rookie, a basic introductory tour is recommended, while devotees will want the behind-the-scenes exposé.